Keep calm and achieve chic everyday style in these pull-on pants, featuring a super flattering stretch knit fabrication. I love these pants. I am 57 and weigh around 170. I bought these in a size 16 and the fit is perfect. The length is exact for me. Ive washed them in cold water on gentle cycle. I put them in the dryer on low heat for about 15 minutes and then hung them to dry. They came out perfect even though the directions says to lay flat to dry. These pants are so comfortable. Feels like you are in your PJs all day long!!! 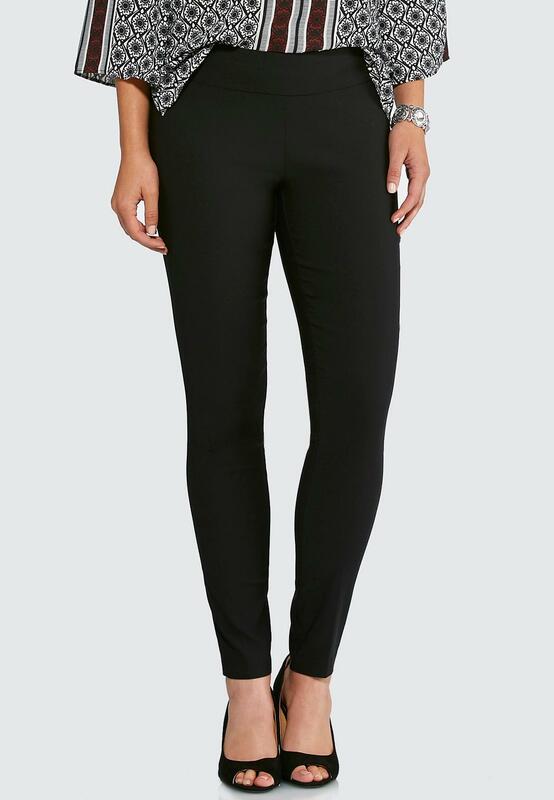 These are the most comfortable and flattering pants and they dont cost a fortune. I want about 5 more pairs of them because theyre so great. Ive been looking for the perfect pair of skinny pants that are comfortable and look good. FOUNDEM!!! I wish they came in more colors. I would love to see them in burgundy or navy or even white. Im going back to Catos today to buy another pair. These are amazing! Please make them in other colors!!! I LOVE these pants. They’re such good quality for the price but they have a problem with the seams getting fuzzy after several washes, which I don’t care for, which is why I gave it 4 Stars Instead of 5. I got on this site after buying a pair of these at local store. Last pair in my size and wow best fitting pants ever. I am 5.2 140 lbs wear so 12 and they look so good. Lol. Being short it’s not easy to find pants that are flattering on me. These are perfect length. I did not have to hem them but if you are tall these might fit a little high on you. Comfy stretchy sort of a cotton sheen feel. You could wear these year around. True to size and generous so not too tight looking as some pull on pants are. These are not. Love them. More colors needed. Reviewed by: Love the pants and shoes! Please make these in more colors! The fit is awesome, very flattering. Materials is so comfortable. These pants are awesome!!! I just bought my 3rd pair and I sure hope Cato will start selling these in different colors soon such as gray, Navy blue, Dark Red, tan, brown, Green etc. They fit so nicely and are so comfortable to wear.